F**k MM#93! I'm sick of seeing his cheesy grin every... f*ck'n...time!!! Somebody stop him!!!! So you're all about the way a rider looks? Who's the sexiest MotoGP rider? 2019 Lorenzo throws his leg over one. 2019 Lorenzo should throw his leg over one. I’m sure Lorenzo will steal errrrr I mean copy MM data next year to insure a Repsol Honda P1 AND P2 standing on the box every race. King of the Ring, baby! [quote=BuckNut;4152208]I’m sure Lorenzo will steal errrrr I mean copy MM data next year to insure a Repsol Honda P1 AND P2 standing on the box every race. I can see that happening I guess, but my gut feeling is that these two are going clash big time. Both guys are big time world champions and will want to keep their reputations of being top dog within the team. I'm not sure JLo's decision to go with Respol Honda is a good idea. That's just my opinion. Last edited by KuroRazgriz; 07-02-2018 at 09:45 AM. I think it's freaking awesome. 1. There's going to be a learning curve for Lorenzo. 2. 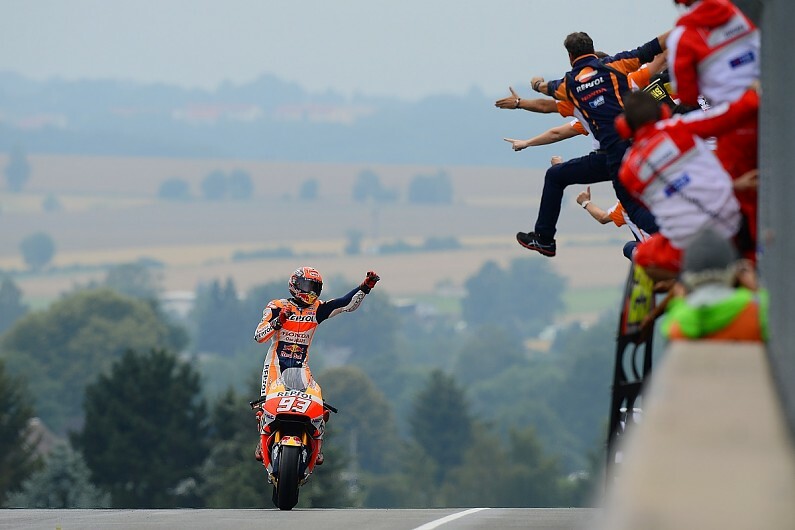 Even when Yamaha had the better bike Marquez still beat Rossi and Lorenzo. I'm not sure JLo's decision to go with Respol Honda is a good idea. When did Jennifer Lopez start riding motorcycles? I bet she looks good on a Honda..
What a flipping show! Lot's of WOW, dang, and HOLY moments! Top 8 were battling the entire time. Ugh...everything is awesome with you when it comes to Honda. Well, by the way I see the Honda RCV is configured, I can foresee that JLo#99 can just throw the leg over and go nuts with it with little difficulty compared to the Ducati. Well he ain't no championships rider! Last edited by KuroRazgriz; 07-02-2018 at 10:16 AM. Well ain't no championships rider! Uh, but he's ridden Ducs and Yamahas. He, along with many others, says the Honda is harder to ride. Plenty of folks are saying Lorenzo will struggle next year and wonder if he can ever win on a Honda. I'm pretty sure he'll get it sorted out eventually. Oh I didn't know he rode Yamaha's too. I didn't figure the Honda is much harder to ride for him. But for Jorge Lorenzo (Shugboogie! ) with the advanced tech support straight from HRC, I don't think it'll take him too long. We just will have to see I guess. Wont happen, they have completely different riding styles. They won't be sharing any setup info. Pedrobot retires after a 18 year Moto GP career. Going out gracefully. Thought he might of went to a satellite or Superbike. He's a person of real class. One the top riders/athletes I really respect. I'm gonna miss the little guy.